You may know a lot about me professionally but there is a lot more about me to know. Here are some fun facts about me, Jamie McCarty. I was born in Connecticut. I have a high school football stadium named after me at a high school I did not attend. I was a member of Tau Kappa Epsilon fraternity at Quinnipiac University. 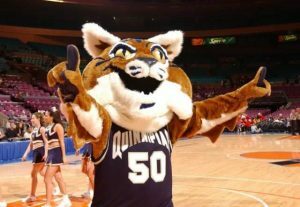 I’ve performed at Madison Square Garden as Quinnipiac’s mascot, Boomer the Bobcat.